It’s not the same world which was a decade ago. Things have paced up, and the online market has started taking itself ahead of the offline one, mainly for making it easier for people to shop, pay and receive the product without them having to move an inch from their PC desk. It was earlier a flurry of offline stores, which came with huge offers and discounts, just to pull the customers towards themselves, let the profits be less. What I’m specifically focusing on, is the online shopping where the buyers and sellers contact each other directly and the 3rd party host is actually a website which lists the product for sale and the buyer has all the options to check the listing, the original photos and the contact details of the seller. It’s mainly advantageous because we are talking more about the second hand products and not the new ones, because the latter anyways will not need so much of photos or stuff but just a trusted seller. One of such arenas which has made a good success in acting a good 3rd party host for the selling of goods is olx, which has some competition but excels in providing a better platform and making it easier for people to list their products for sale, and even easier for the buyers to browse through the categories, open the page and directly contact the seller from there. Every state in the country is listed, and again within that, a city and every area in it. Making it easier for people to search and filter through so that they can look for the particular product in their area and the checking of the product can be done directly rather than just photos. Better than the standard e-commerce sites, right? 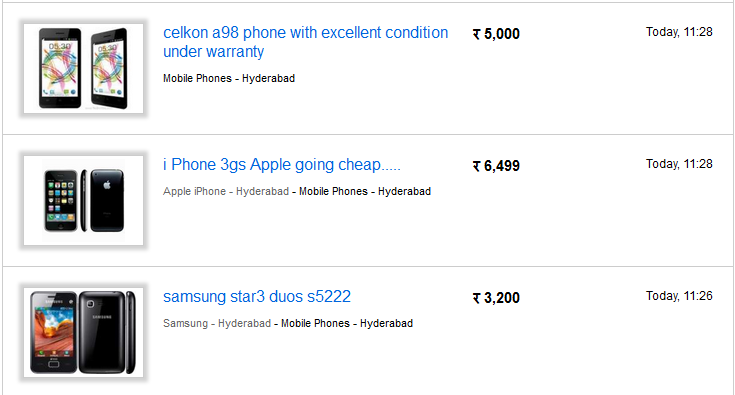 OLX doesn’t limit itself to the second hand goods, because there is no rule as such and people can sell new products too but the people who are mainly benefited from the site are the ones who are trying to re-locate and are looking for an easiest option to sell off the used stuff for cheap without the hassle of roaming around looking for buyers. Listing from the website? that’s not it. People always want to do things on-the-go. Smartphones are the ones that make things easier to do, and on the go. As I set focus on olx here, the same company has got the applications for all the different mobile phones operating systems, including Android, iOS, Blackberry, Windows Phone, Nokia based OS. The app does a good job in helping the users search for the relevant ads around their location, and also in replying to the ad from within the same app. Listing an ad is quite simple too, where you can take the picture of the product with the phone camera, upload it from there and enter the other details to list it for sale. Apart from the above Mobile OS mentioned, olx has even made it easier for other mobile phone users with a separate mobile version of the website which is all a step to make dealing easier. The TV campaign in India is pretty neat, with the various ads showing how easy it is to decide, list and sell the old goods to replace with the new ones. Check out the OLX YouTube Channel to see all their interesting commercials, the same which are run on the TVs.